This rustic trivet features an upcycled horseshoe embraced by a swirling heart of hand-hammered steel. A horseshoe is both an iconic good luck symbol, and a reminder of a simpler, traditional way of life. This horseshoe is embraced by a band of metal that reaches up to form a heart with a curlicue flourish. The fluid form of the heavy metal comes from the blacksmithing talents of Alexandra Paliwoda, who applies her skills to both shoeing horses and decorative work. The piece is itself a blending of the practical and the beautiful: it functions as a sturdy trivet, protecting your wooden surfaces and countertops, but when not in use it is elegant enough to display on the walls for a touch of rustic romance. Handmade in Idaho. 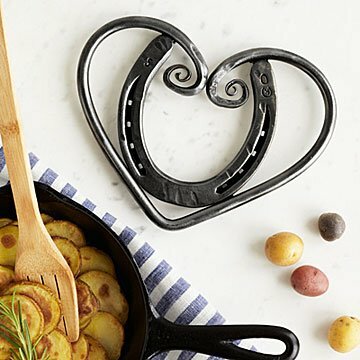 Combining form and function, the Horseshoe Horse Trivet looks equally charming when it’s holding a home cooked casserole or hanging above your kitchen table. The horseshoe stands as a welcoming symbol of luck, while the heart provides a curling frame that’s both romantic and rustic. Here at Backcountry Blacksmith, our motto is "inspired by all things wild and free". Mindfully, actively caring for the ecology surrounding us that is ever so fragile, inspiration comes from nature and also by giving back to nature. We create functional and visual art from recycled steel, hand-forging lasting products that have minimal waste or carbon footprint in terms of production. Utilizing recycled steel, environmentally friendly finishes and recycled packaging supplies we hope to help keep the wild as free and unhindered by overuse as we can. We also recycle over 90% of our unusable items and waste after production is complete. My hope is to introduce through our work a small reminder of the great outdoors, and the passion and need to care for it. The Backcountry Blacksmith pays employees a starting wage of $15/hr., which exceeds Teton County's living wage. No formalized PTO program — allow for open structuring of employee work time, provided projects are completed for deadline. Primary Material Steel Recycling Process: They use recycled low carbon (ferrous) steel and iron as their primary material. Any steel waste, from used vehicles to scrap steel and waste from mass production, is melted down, re-poured into usable forms, and can be recycled again and again without changing its properties. They also utilize old horseshoes, scrap steel from farms, and scrap yards. Secondary Material Packaging Supplies Process: All items are packaged with recycled paper products, unbleached and thus less processed during recycling. They use old newspapers and packaging products that arrive at the shop for filling in cartons on orders, and recycle any and all paper packaging that cannot be used again. Made from 100% recycled steel. The trivet is packaged/wrapped in Kraft recycled brown paper, and sealed with a Kraft recycled brown square sticker. The artist cards that are inside of each package are attached to the trivet via a kraft recycled twist tie, and are printed on recycled paper. There's one place—and only one place—where you'll find the Horseshoe Heart Trivet: UncommonGoods. 8" L x 8" W; 1.5 lbs. The heart trivet has four tiny pedestals which elevate it from the surface it rests on. These legs allow airflow underneath and prevents direct contact with table surfaces. Very durable trivet that I keep on my countertop. My sister immediately wanted to hand it as decoration but ultimately decided it would be better used as a trivet. Perfect gift for any horse lover! This was the perfect gift for two horse owners/lovers in the family. Both recipients were very appreciative. My niece texted me as soon as she received her trivet. She absolutely loved it. She felt it was a very personal thoughtful gift since she has horses but it is beautiful enough for even non horse households. I have purchased this product before for a gift. My most popular ways to use this product is as a wall hanging and a trivet. My son and his new fiancÃ© love horses and this was so perfect as a engagement/housewarming gift. They loved it. They thought I had it custom made. Scored major gift giving points with this.